Carnivorous perennial that forms tubular insect traps by adaptation of the leaf. 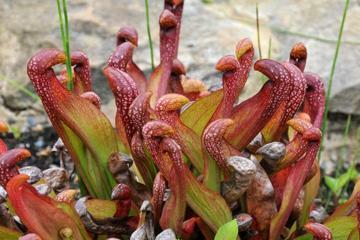 Low growing species that produces pitchers angled or flattened to the ground. They have rounded hoods and are usually strongly flushed red, sometimes with white marking and variable dark red veining. Red flowers in spring. Needs consistently wet or boggy, lime-free soil, which is low in nutriants. Will survive periods of partial or full submersion in water. Full sun in a sheltered position. Prefers warm conditions and is not frost hardy.